How effective is the learning support that Big Local offers residents? People in Big Local areas like to talk to and learn from other Big Local areas. That’s always been the case and Local Trust has supported this through learning and networking activities ever since Big Local began. Opportunities for learning have included a wide range of different topics: from how to get people involved, to community food growing, and involving young people. As well as these ongoing events, the largest learning and networking opportunities have been the Spring Events held each year since 2012. These take place in different locations around the country and bring lots of different areas together to celebrate the achievements and successes of Big Local. Since March 2015, Big Local residents have also been able to attend training courses to help give them the skills they need to make Big Local happen. The training covers topics such as leadership and team skills, public speaking, and working with local media. Rocket Science UK is an evaluation and research consultancy firm and our team has a long history of involvement in Big Local. In December 2015, we began a research project to evaluate how well the spectrum of training courses and learning and networking events have been doing. 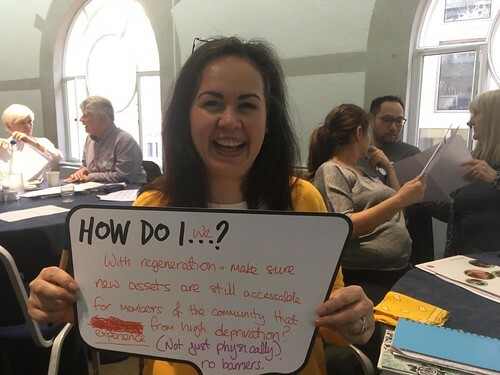 We talked to learning providers, Big Local reps and – most importantly – we talked to and visited people involved in Big Local about their experiences. We sent a survey to over 600 people in Big Local areas and the findings were very positive: 90% of respondents said that the training or learning and networking event they attended had been right for them and 83% were satisfied or entirely satisfied with it. People in Big Local areas like the opportunity to talk to and connect with others in Big Local areas; to share experience as well as challenges and feel reassured that they’re not on their own. Networking opportunities also provide people with inspiration, new ideas and different approaches. Big Local areas aren’t standing still. Typically, activities in areas are getting more complex as areas start putting their Big Local plans into action, new projects take off the ground and more people get involved. Over the years Local Trust has been developing the support it offers to reflect where Big Local areas are on their journey. For example, last year Local Trust introduced training in response to feedback from those involved about the skills needed to deliver Big Local. Local Trust will need to continue to develop the kinds of support it offers to meet the needs of those involved. Our research shows that the large majority of Big Local areas participated in a learning and networking event in 2014-2015, with the annual Spring Events attracting hundreds of people each year. Training courses were introduced in March 2015 and since then over a third of Big Local areas have taken part in these courses on offer to build skills and confidence. There are advantages to going on training which is a distance away from your Big Local area – it can be helpful to be in a new environment or be away from everyday distractions. But if the journey is too far or too difficult then this becomes a barrier. The distance and time taken to get to events were a commonly cited reason for not going to training. One way around the challenge of distance is to look at digital alternatives, such as live streaming or sign-posting to relevant online content. This style of learning doesn’t suit everyone but it could be a way to enable more people to get the skills they need to help their Big Local area. One of the biggest challenges for attendees is after training or a learning and networking event – when chances to feedback learning to others in the Big Local area can be limited. Providers can help by ‘checking in’ on attendees afterwards and also by providing a simple checklist of key points for discussion at partnership meetings. Being able to learn from other Big Local areas is one of the biggest benefits of learning and networking support. Training courses are now adding a valuable element of skills development and confidence building, too. The challenge for Local Trust is to ensure that as many people as possible can benefit from the opportunities of learning support and to continue to adapt to meet the changing and growing needs of Big Local areas.